Striking in appearance, the Hangul or Kashmir Stag is the largest of the Himalayan ungulates. It is the most endangered sub-species of Red deer in the world today. It derives its name from 'Han' which is the local name for the horse chestnut tree, the fruit of which the deer feed on. There is much colour variation in its coat, which ranges from a light shade of brown in summer, to a dark and rich colour during the rutting season and in winter. The white rump patch, which does not extend beyond the tail, is most conspicuous. The fawns have distinct spots during the first few weeks of their lives after which these fade away rapidly. Large adult stags are known for their impressive rack of antlers and the species was protected as Royal game by the former Maharaja of Jammu and Kashmir. Antlers of upto 50 inches in length have been recorded and 12 to 13 tines on a set are the norm. Once widespread across Kashmir, their range extended across Kistawar into Himachal Pradesh. Here again, habitat loss and large-scale killing has reduced this majestic deer to a precarious position with the last remaining sizable population found only at Dachigam National Park in the Kashmir valley. Very much at home in the forest, this magnificent deer can be seen in the lower valleys of Dachigam National Park for most parts of the year, though their numbers here are most concentrated from October through to March. Found normally in small groups, Hangul use the forests of the Dachigam valley as an important feeding ground and move up the hill slopes in search of grazing. Individual stags are more likely to be seen feeding singly on the hill slopes. They move about quite a lot from one area to another, and make extensive use of the side drainages and forest patches in their search for good forage. Food preferences vary greatly according to the season and include plants such as Fraximus hockeri, Jasminum humile, Hemerocallis fulva, buds of woody species, and perennial herbs. Hangul need to be on the look out for Leopard (Panthera pardus) which is their main natural predator, though Himalayan Black Bear, also found in Dachigam will actively look for new born fawn to predate upon and will also kill an incapacitated adult should they come across one. In March and April the stags shed their antlers and begin moving to the upper reaches and will remain in the alpine meadows and pine forests of Upper Dachigam between 2500 to 3500 mts. through the summer months, only to start descending to the lower valley when the new set of antlers have hardened by September. 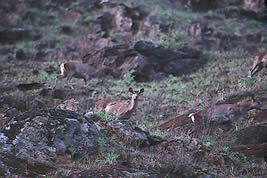 By October, most of Dachigam's Hangul are concentrated in the lower valley and the stags have joined the hinds. This is when the rutting season commences, and the valleys of Lower Dachigam reverberate with the resonant call of the stags. 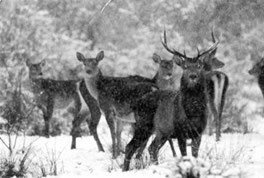 Unlike the Red deer of Scotland, Hangul do not round up a large harem of hinds. At the onset of the rut, fights erupt between rival stags to settle their hierarchy. A stag will pursue a receptive female through the forest and up hill slopes till mating takes place. The gestation period is 7-8 months and the fawns, are dropped in the side nallahs of the lower valley in late May and June. After dropping their fawns, the hinds too leave the lowest part of the valley and move to the upper slopes where the best and most nutritious pastures are available, and will use these areas for raising their young till the weather turns harsh, forcing them down again. Prior to independence, estimates of Hangul numbers stood at around 3000. However by 1970, the numbers had dropped to an all time low of 140 - 170. With the promulgation of the Wildlife Protection Act of 1972, the Hangul was given Schedule I status and afforded protection. Their numbers have revived to about 600 today. The continued political turmoil in the Kashmir Valley is the major threat today with Hangul being poached primarily for meat. 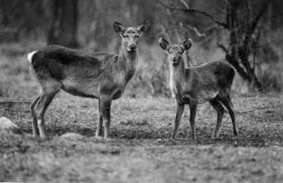 Disturbance of Hangul habitat by human activity is a problem at Dachigam and need exists to stop grazing by domestic livestock within the Park. Extending available habitat would be the best measure to insure their long-term survival of the Hangul. For this, remaining forest outside of Dachigam needs to be brought under protection and strong measures taken to stop tree cutting and further degradation of habitat by overgrazing by domestic stock. Anti- poaching measures need constant improvement and though poaching has been kept under control, constant vigil needs to be maintained. Schaller George B: 1977 - Mountain Monarchs; University of Chicago Press.